Born in Hartford, Connecticut, on August 10, 1962, Suzanne Collins grew up in a military family, which meant she moved around quite a bit. Her time spent moving was inspiration for a lot of her written and television work. Collins ended up graduating from high school in Alabama before moving away for college. She graduated with her bachelor’s degree in drama and telecommunications from Indiana University before she began her career in television. In 1991, Collins began writing for Nickelodeon on various television shows that were extremely popular on the network. She also wrote for Scholastic Entertainment and on many television specials for the holidays. This work led her to writing for WB kids shows, where she got inspiration from author James Proimos to become an author herself. Although she enjoyed working in children’s television, her true passion was for writing and sharing a story. Her first book was Gregor the Overlander, which was one of five in the Underland Chronicles series. She wrote these from 2003 to 2007 and each were bestsellers as they were released. She also wrote another children’s book in 2005, between books in the Underland Chronicles series. 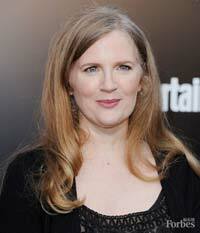 Suzanne’s most popular book was released by Scholastic Press in 2008 and was named The Hunger Games. It was part of a trilogy with two other books, all of which became bestsellers. These books sold millions of copies all over the world and still continue to do so. The popularity of this trilogy resulted in a movie being made and Collins even wrote the adaptation herself. The Hunger Games movie was released in March of 2012 and Catching Fire, the second in the series, is set to release in November of 2013. The success that Suzanne received from The Hunger Games led to her being named “one of the most influential people in 2010” by Time magazine. Amazon.com has also stated that Collins currently holds the name as the best-selling author for Kindle books. Suzanne wrote two other books during her career that were well received by parents and children. Suzanne lives on the East coast in Connecticut with her husband. She has two children and is still working on books today. Although she is not set to release any other trilogies or series books in the near future, she does have a book coming out on September 10, 2013. This is Year of the Jungle, which is a children’s picture book about a girl learning to live without her father after he goes off to war. Suzanne’s books can easily be found today at book stores, online and in electronic forms through electronic readers. Information about her latest works can be found through her website and book stores.